Whether you are customizing your high-end bike, or simply want to revitalize a garage sale find, powder coating allows you to both rejuvenate and protect those metal items for years to come. Most people are not familiar with the process of powder coating, or they assume powder coating is an expensive process reserved for big-budget professional projects. At Electro Tech Powder Coating, we are ready to show you the incredible utility and versatility of powder coating, as well as just how affordable this finish truly is. 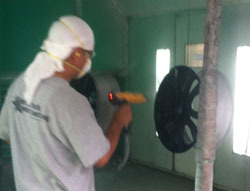 Powder coating is a simple process that utilizes the best science to create a durable finish. An electrostatic powder in the color of your choice is applied to your metal item. The item is then cured using heat, and the powder flows together (similar to melting) and the powder bonds to the metal forming a skin. While the concept may seem strange to new clients, you may be surprised that you probably already have several powder coated items in your home. Household appliances like refrigerators or stand mixers, as well as tool boxes and light fixtures are just a few of items that are commonly powder coated. Is Powder Coating Worth the Money? d will last for years longer than paint, especially in extreme elements. Paint finishes are easily damaged, and quickly fade and chip. Powder coating, on the other hand, looks new for years. If you want to know why powder coating is better than painting, the answer is simple; you will invest in powder coating once, but if you choose paint, be prepared for rapid degradation of your finish and constant upkeep. Another benefit to powder coating is its insulating properties. For example, ceramic coating is often used to insulate the exhaust systems for both classic and performance cars. Auto enthusiasts also use powder coating for customized parts like roll bars and rims. At Electro Tech, we know that new clients have a lot of questions about powder coating, and we are here to help. Let us guide you through the process and show you why this affordable finish is well worth the investment. To learn more, call us and we will be happy to assist you!